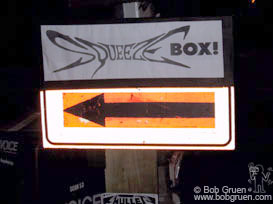 Squeezebox – a party started by Michael Schmidt, has been running at Don Hill’s club in New York for years. 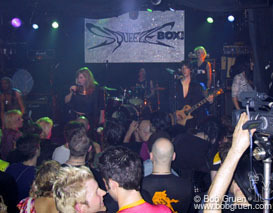 It’s been a great party of straight and gay rock’n’rollers with bands and guest spots backed by a rockin’ house band that can play anything and make it fun. In such a wildly varied crowd, MC Mistress Formika always made everyone feel welcome and we’ve had so many great times there. Friday May 18th was the final party – this page shows a few scenes from the last night. 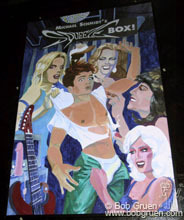 May 18 – Poster by Mike Brisbois shown at the party. When I first walked in, the place was already so hot and crowded that it was like a sauna. 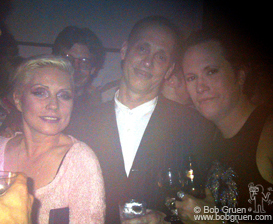 The first photo I took, this one of Debbie Harry, John Waters, and Michael Schmidt was foggy from the moisture on the lens. Jayne County backstage with Bob Gruen’s wife, fashion designer Elizabeth Gregory and Bebe Buell. Watch for Bebe’s new book ‘Rebel Heart – An American Rock ‘n’ Roll Journey’ out this summer. Bebe Buell rocks the house! 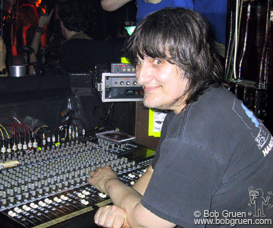 Master sound man, NiteBob, keeps things clear. 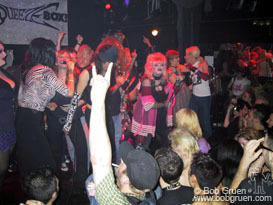 Downstairs Cherie Currie waits to go on with the fabulous Chi Chi Valenti, designer Kitty Boots and DJ Johnny Dynell. 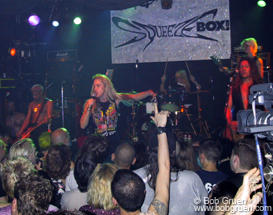 Cherie Currie was great singing with the Squeezebox Band with a rare appearance of Cherie’s fellow Runaway bandmate, Sandy West. 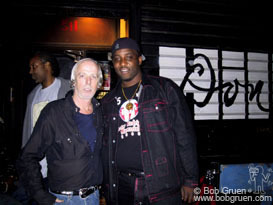 Don Hill checks with security man Carl after the record breaking crowd filled the club (the line outside had been all the way down the block). 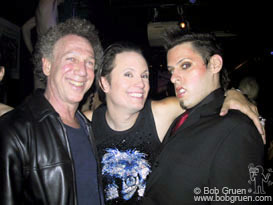 Miss Guy, Bob Gruen and Michael Schmidt. Bob and Michael thank hardworking door guy Thomas Onorato. 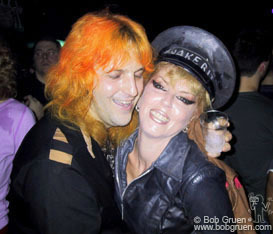 Electric Monster Tony Mann gets a hug from Gyda Gash. 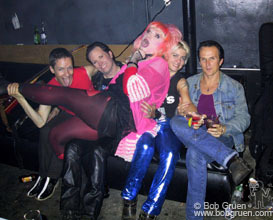 After the show, Jayne lands on Michael’s lap while Squeezebox band bassplayer Greta, with her husband Duard, (on right) try to get out from under.